The Emirates Nuclear Energy Corporation (Enec) has been granted approval for additional civil works relating to nuclear plants Barakah Units 3 and 4 under its limited construction licence. This approval will ensure that the units remain on schedule to enter commercial operations in 2019 and 2020 respectively, said a Wam report. 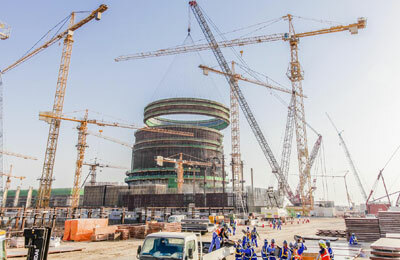 Enec received the approval from the UAE Federal Authority for Nuclear Regulation (FANR) for civil works in preparation for pouring safety concrete on the reactor containment building, auxiliary building, turbine generator building, component cooling water heat exchanger building, essential service water intake structure, and compound building. This will allow installation of structural features such as formwork, rebar, embedded anchor bolts, electrical conduit, steel plates and piping. Enec is not authorised to pour initial safety concrete for Units 3 and 4 until granted a construction licence from FANR. ENEC submitted its application for Barakah Units 3 and 4 to FANR on March 1, 2013 and the application is currently under review. Enec also submitted an environmental impact assessment, which requires approval from the Environment Agency - Abu Dhabi. Enec is working to deliver a world-class peaceful nuclear energy program to the UAE. By 2020, four nuclear energy plants will be generating up to a quarter of the nation's electricity supply. The first two plants are now more than 35 per cent completed, and are being constructed safely, on time and within budget. Unit 1 is scheduled to enter commercial operations in 2017, and unit 2 is scheduled for operations in 2018, pending regulatory approvals. Enec will apply for an operating license for units 1 and 2 in 2015.